Please share this important video! Akaka Bill by “Addendum” was the wrong thing to attempt in the first place. Why it’s not OK to be a RINO. Carroll Calls On Supporters to Wage a Social Media Blitz. We don’t have mainland PAC’s to run television ads about how great we are, but what we do have is people like you. We need your help now to get our message out. I’ve prepared a simple flyer that can be sent via the internet by my supporters; downloaded and copied on your printers and posted in Facebook. I want you all to “like” it, to “resend” it, to “Twitter” it, to “Pin” it, and to send it to every single person on your email lists. I need you to do all of those things for me in these final weeks of the campaign. Because Republicans need to know they still have a choice. John Carroll is asking his friends to send this message to everyone they know on the Internet. 1. Lingle renigged on the Taxpayer Protection Pledge she had signed by allowing the largest tax increase in the history of Hawaii; she allowed the rail excise tax surcharge. I have signed the No New Tax pledge this year and Lingle has not. 2. Like many conservative Republicans, I am pro-life. Lingle has always been pro-choice, and is soft on Obamacare. While I view Obamacare to be an intrusion on the constitutional separation of Church and State, Mrs. Lingle see’s no such problem. 3. I think that the archaic Jones Act is the main reason that our economy in Hawaii suffers and our cost of living is 30% (at least) higher than it should be. This old law protects Matson and A&B’s virtual monopoly on shipping to Hawaii, and drastically limits our ability to ship local products out and import the materials our businesses need to compete. Lingle supports the Jones Act, and takes massive amounts of campaign contributions from A&B and Matson. I have taken NO money from PAC’s, and will represent the peoples’ interests, not those of my big contributors. 4. And worst of all, Lingle has renounced the very principles of the Republican Party. She can’t even bring herself to be called a Republican; choosing instead to label herself a “bipartisan.” She has refused to debate her Republican rivals, and proceed to run against her assumed opponents in the General Election, where she sounds like a Democrat and supporter of President Obama. She has so arrogantly assumed her victory in the Republican Primary that she has proceeded to throw our values and principles “under the bus.” Stand up for what we Conservatives believe, and let Mrs. Lingle know that you are not sheep to be herded in line with her political ambitions. Stand up for your beliefs, and stand with me! PLEASE HELP ME GET THIS IMPORTANT MESSAGE OUT TO OUR FELLOW REPUBLICANS BY AUGUST 11TH. 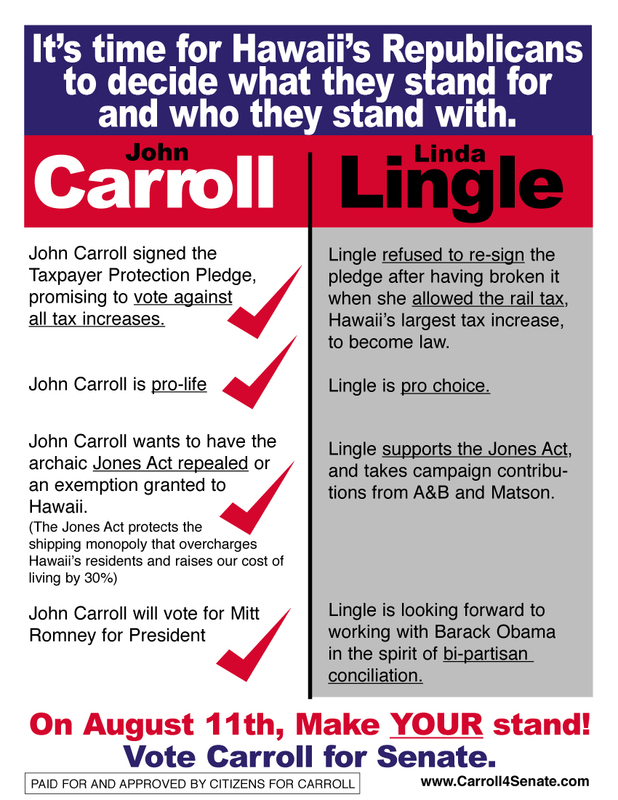 Carroll further pointed out that Lingle’s lunge to the left was punctuated by her endorsement of President Obama’s pro-Jones Act position. “She is no longer even running as a Republican ,” stated Carroll. Carroll said that the Jones Act is a relic of the 1920’s, and that Mrs. Lingle speech supporting it touted equally old and irrelevant arguments. Carroll said that the Jones Act today simply maintains the virtual monopoly on shipping serving Hawaii, forcing up everyone’s cost of living by as much as 30%. He also said that it also cripples Hawaii’s economy because of its protectionist mandate. By refusing to allow free trade to Hawaii we are doomed to a non-competitive, stagnant economy because of cost of materials and shipping. Carroll shot down Lingle’s argument about national security. He said the Department of Defense doesn’t even limit itself to domestic hulls when it deploys troops because of the exorbitant costs. He took exception to Lingle’s statement that she would “study” the problem if elected. 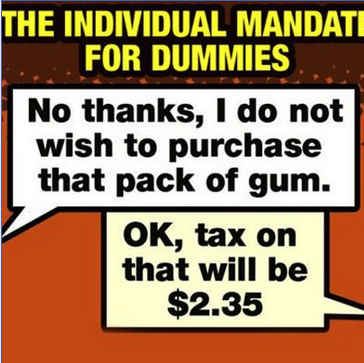 Obamacare opens the door for unlimited taxation by the Federal government. BY JOHN CARROLL – The recent Supreme Court ruling on the legality of Obamacare opens the door to more administrative taxes on our citizens. Justice Roberts rightly points out the conflict of Obamacare and the commerce clauses of the U.S. Constitution, He then, inexplicably, allows it to go through anyway. I will fight to repeal Obamacare as a U.S. Senator. I will also fight to re-establish the constitutionally mandated boundaries of the executive branch of the government. The socialization of healthcare has a certain popular appeal to those who haven’t thought through the costs and ramifications for personal freedom that this system will create. I will support the presidential campaign of Mitt Romney, with the repeal of Obamacare as one of the many, many reasons why we need his leadership in the White House. Lord Monckton listens attentively to John Carroll at last Friday’s fundraiser in Kailua. 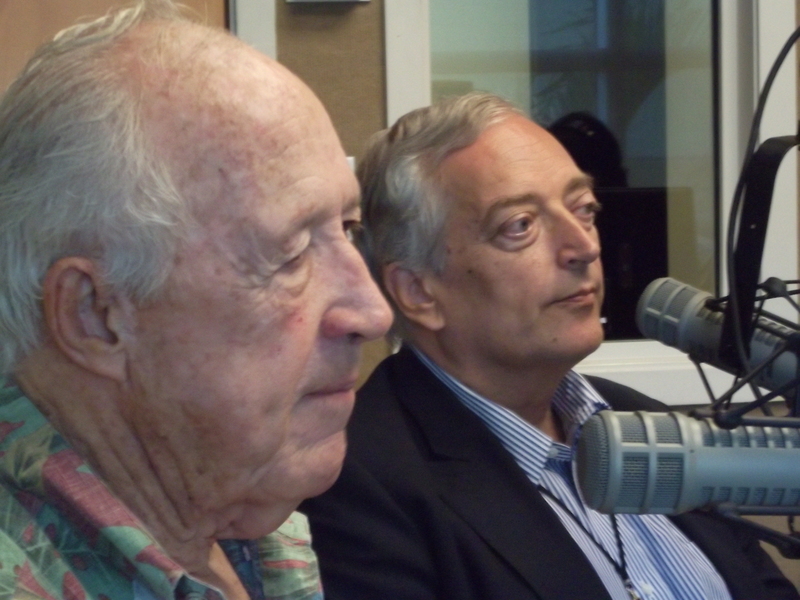 John Carroll and Lord Christopher Monckton hit the airways this morning with host Mike Buck on KHNR. Crowd Responds to Carroll at KITV Debate. 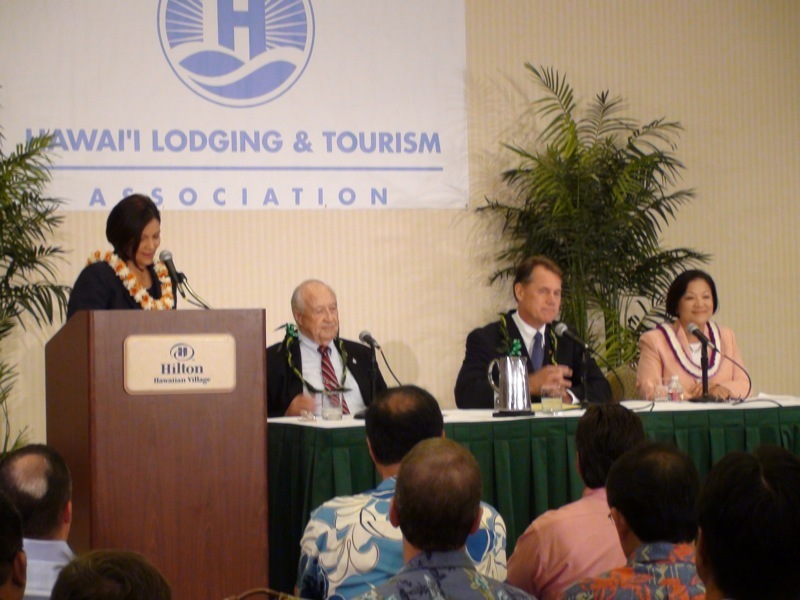 Carroll “endears” himself to the audience at the Hawaii Lodging and Tourism Association sponsored U.S. Senatorial debate. Televised by KITV and moderated by Anchorwoman Paula Akana, the debate was lively with the absent Linda Lingle the target of barbs from all side. John let Linda Lingle know she was missed at today’s debate. According the CivilBeat: “Republican Senate candidate John Carroll was the clear winner when it came to endearing himself with the audience,” in their early coverage story Hirono and Case Scrap, But Carroll Wins Laughs. “Carroll certainly made a case for his argument that his primary opponent, Linda Lingle, should debate him — for example, criticizing her failure to get an EIS for the Hawaii Superferry. WATCH THE RE-BROADCAST OF THE DEBATE ON KITV AT 4:00 PM THIS SATURDAY, JUNE 2ND. Get your tickets from John’s supporters, or by simply making a contribution online HERE. Join the fun at Pinky’s Pupu Bar & Grill in Kailua on June 8th from 5:30 to 7:30! Each contribution of $100 will receive a ticket to the June 8th fundraiser. Help us raise money for John Carroll so he can get his message out. John is the ONLY conservative candidate for the U.S. Senate and he needs our help NOW! Let’s Help John Raise Money and Get His Message Out! Help support Hawaii’s only conservative candidate for the U.S Senate, John Carroll! Now you can buy fundraiser tickets online by simply making a contributions online. With every contribution of $100, you will automatically receive a ticket to John’s exciting June 8th fundraiser at Pinky’s Pupu Bar and Grill in Kailua! Don’t miss out on the food, fun and traditional conservative common sense of John Carroll. Help John By Emailing These Important Messages To Your Friends! Click on this image and email the URL to your friends! Why Lingle Can’t Afford an Honest Debate. Tuesday’s Republican Caucus – It’s Important That YOU Participate! 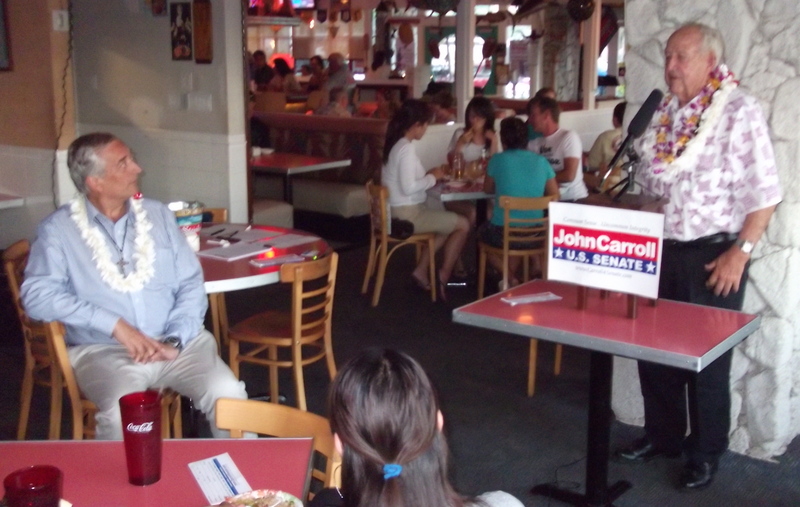 HELP ELECT THE BEST PERSON TO REPRESENT HAWAII IN THE U.S. SENATE, JOHN S. CARROLL!